In my last post about Wattpad, I talked about my failed attempts to link to Innerscape, Part 1, and the workaround I finally discovered. I was not particularly happy with the Wattpad interface, and said so. Since then, Fernanda from Wattpad support replied to my email and explained how to link to my story properly. 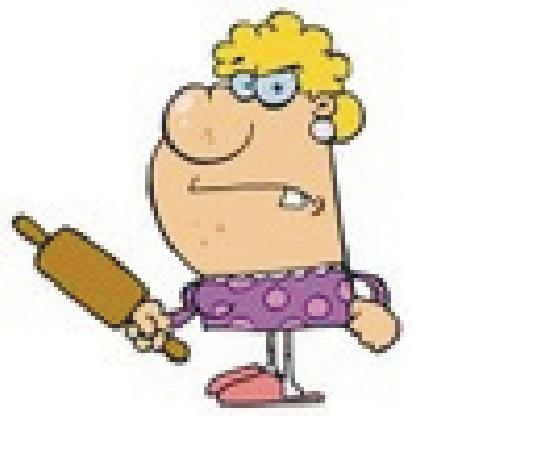 The following is a quick, pictorial version of what Fernanda told me. Once you have created and published your story to Wattpad, you are ready to promote it beyond Wattpad. From the drop down list, select the ‘My Profile’ option. 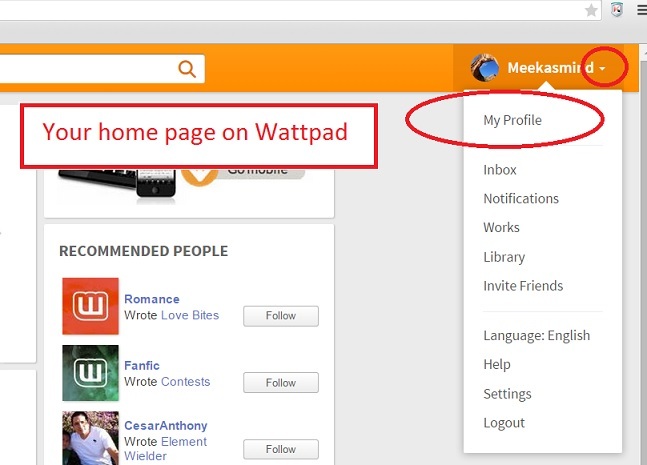 Step 2 The ‘My Profile’ page contains the About [you] as well as a list of stories you have published to Wattpad. In the screenshot below, you can see that I’ve only published one story [Innerscape]. To read [or link to] any of the stories you have published, click on the relevant link. For me, the link is for Innerscape. You should now be looking at a sort of public page on which anyone can read your story. Once the URL of your story is highlighted in blue, simply copy and paste it into your tweet, FB post, blog post or other promotional site. If you try to do any of this from within the ‘Works’ option [the obvious place to look for your story], the resultant URL will belong to your private Wattpad account and hence will not be accessible to other people – i.e. it won’t work! I can see the programming logic behind all this but …a good interface would not hide such a common function in such a non-intuitive location. Or perhaps the Devs of Wattpad assume that anyone publishing material on Wattpad will not be interested in promoting their work anywhere else. -shrug- Or maybe they don’t want to clutter up the interface with all this unsightly and potentially technical stuff? I don’t know what the answer is, but I believe most current user interfaces are hell bent on being innovative and different, and beggar the functionality. I’ve suffered through the latest, ongoing transformation of the WordPress.com interface, and it appears I shall have to suffer from the Wattpad one as well. Perhaps I should be more diplomatic. Nope. Poor design is poor design no matter what the intention of the developers may be. 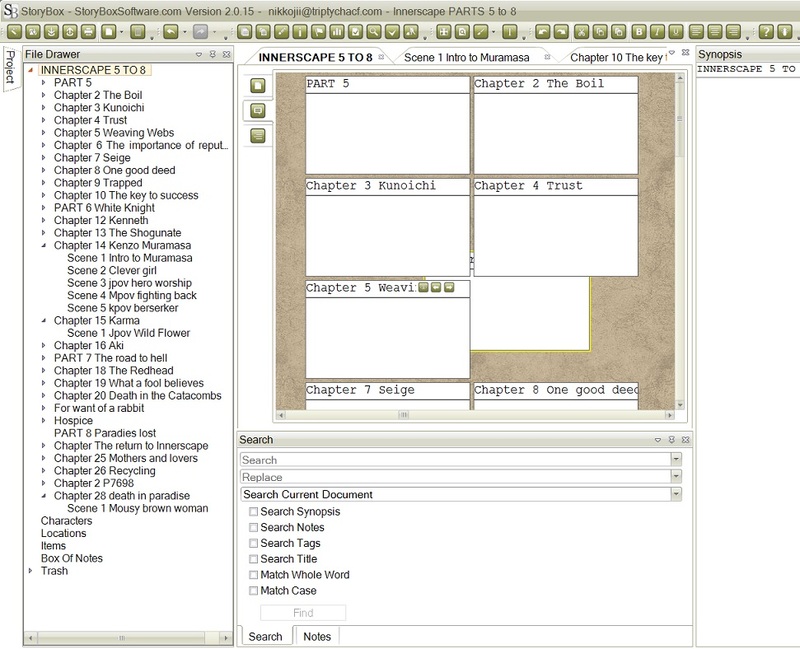 Tic [toc] – A clickable Table of Contents! To explain why this is making me so happy I have to backtrack a little to a comment Metan made last week about moving the Vokhtan dictionary to the front so people could see it. Given the extreme ‘otherness’ issues of Vokhtah, and the fact that so much is explained in the dictionary, I finally pulled my finger out and re-arranged the layout to have the dictionary right at the front. That was when I realised the problem was not so much that the dictionary was at the back, but that no one knew it was there. My next experiment was to type up a manual Table of Contents showing the dictionary, and insert it into the book. I put the new page at the front, where it would be nice and visible. It looked good, but was like a politician’s promise – not worth the pixels it was written in because it had no functionality. To look something up in the dictionary you still had to get to the end of the book, or fiddle with the Kindle Go-to function. By this point I was literally pulling chunks of hair out. In desperation I emailed the wonderful Mark Fassett [the developer of StoryBox, the writing software I use]. 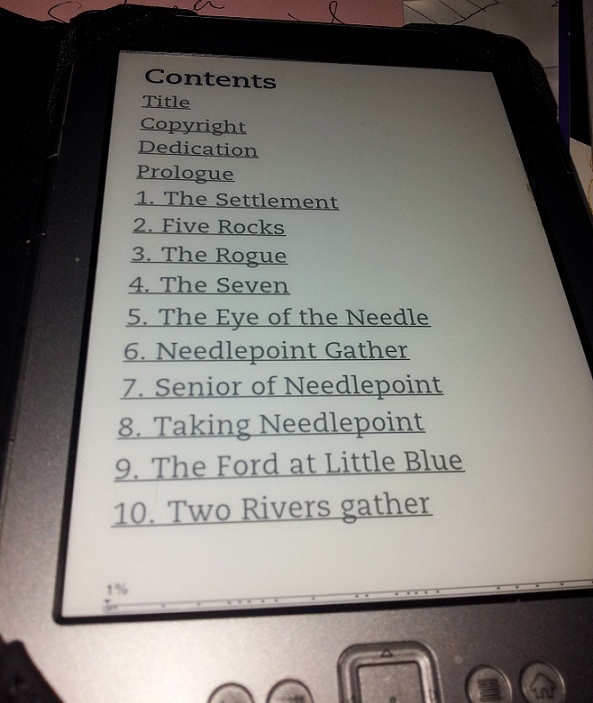 Was there someway of setting up a clickable Table of Contents in the actual ebook, I asked. [toc] Mark replied. He actually said a few more things as well, but the nub of it was that lovely little command. 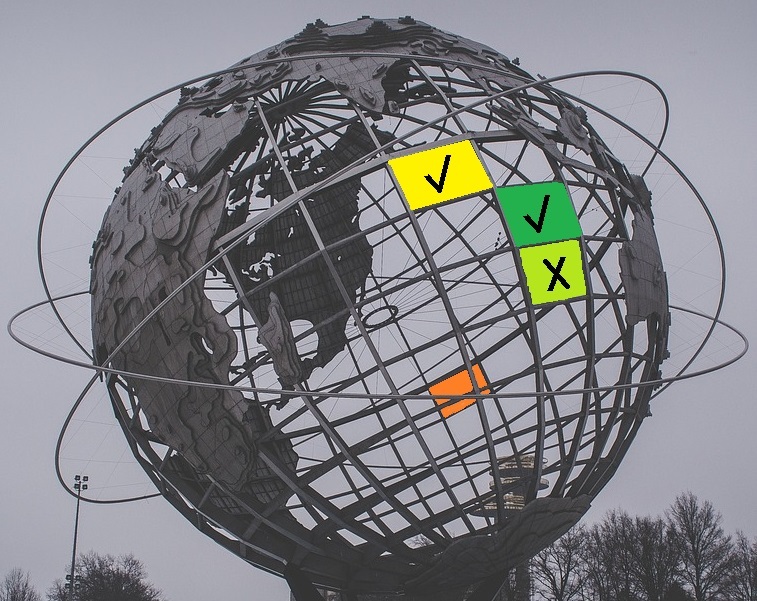 Of course my implementation managed to screw things up the first time around, but now I know how to do it – and it works like an absolute dream! Ta dah! Step 1 Add a new document [not chapter or scene] to your story. Step 2 Move that document to the exact position where you want the Table of Contents to appear. Step 3 Type [toc] in the new document. 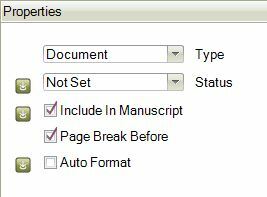 Step 4 In the Properties pane, be sure to tick the boxes for ‘Include in Manuscript’ and ‘Page Break before’. 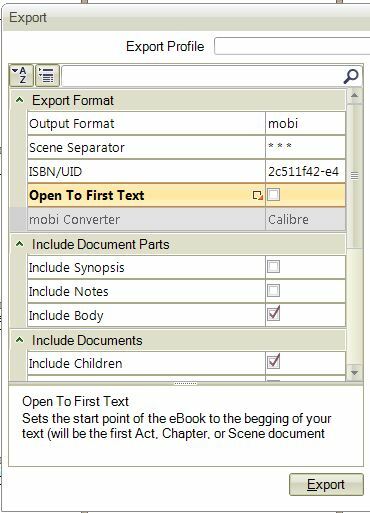 Step 5 Select Export, make sure the output format is set to mobi, and be sure to untick the box that says ‘Start at first text’. And that’s it, except for one more little thing. If, like me, you use Calibre to convert your mobi file to Kindle format, do NOT mess with any of the Calibre settings for Table of Contents. That was my big mistake. I messed. None of those settings are needed because that lovely, wonderful [toc] command has already done all the work. StoryBox truly is an amazing writing tool. I’ve loved it all along, but today I’m just in awe of how powerful it is. If you write, and you’re an indie, then you need StoryBox. I’m serious. Apologies! I only just found out that the developer, Mark Fassett, had this special on. He is a great developer, but seriously needs to work on his marketing! He doesn’t even have this great deal on his front page, I had to dig to find the direct url for this Nanowrimo 2012 StoryBox special offer. I reviewed StoryBox ages ago and I’m still using it and loving it. I won’t go so far as to say it made me win this year’s nano [although it helped], but it did make getting my thoughts/plot in order easier, and it definitely made posting my excerpts a lot easier. Now I’m going to shut up so you can grab StoryBox as time is literally running out. Trust me, you do want this software!